///Few encounters with the Termagant are recorded; survivors turned back by O'N have few memories to report and their ships return with permanently damaged blackboxes. It is believed that most of the missing extrauniversal craft either join forces with O'N or become marooned on the worlds they were meant to develop. 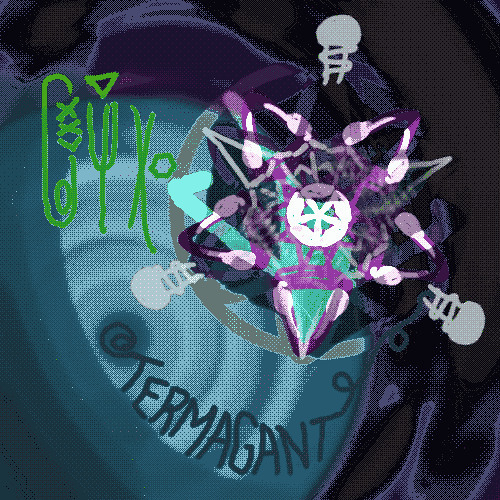 The Termagant's particular psychic signature suggests that novel lifeforms are present on board -- whether altered crew members or extrahuman additions -- sibilating a persistent, strange chorus. much atmosphere, so vibes! i'm imagining some serious giger aesthetics with this one! and i can even headbob to it. favorited!